This is a topic that I’ve really been itching to touch for a while now. It’s time to spend a little time talking about the Imagination pavilion. It was, in your not-so-humble manifesto author’s opinion, a nearly perfect pavilion. A microcosm of what made Epcot Center so special. With it’s unique exterior, multiple attractions, commitment to theme from outside to inside, it’s whimsy, it’s charm, and it’s intelligence, it contained everything that made an original Epcot Center attraction great. I’ve had this in mind to talk about all weekend, and just didn’t get a chance to sit down and write it. This isn’t something in which I really plan on complaining about Disney’s lack of, well, anything really in regards to current Epcot. It’s not really something that they probably have put a lot of thought into, it’s fairly static. There is a little complaining of course, not everything is rosy, but overall not much. Today I want to talk a little about the overall aesthetic of the park. The design of the buildings, the walkways, the greenspaces, the water, just about everything. I’m going to steal pictures from online to show some things, if you notice some watermarks on the pictures, just remember to visit their lovely sites as well. I’ve not had time to dig deeply through my childhood pictures to look for photos of my own (which I will be doing at some point), so theft is my main option here. There are likely going to be a lot of pictures in today’s post. For a discussion on the overall design of the park, I’ll admit that I’m skipping over some of the genesis of what the park was when it started on Walt Disney’s watch. The park that was once his brainchild was vastly different than what opened on Oct 1st 1982. I think comparing this over time is just not very relevant, though I’m sure many people have, and maybe someday I will myself. I’ll also likely skip over some of the early versions of the park that were modified over time as the designers worked to take Walt’s vision and turn it into something that would work as a theme park. I likely will cover some of this later as well when I get to talking about a major change I’d love to see made in World Showcase. It is such an interesting thought that the designers originally had World Showcase as the entrance, with Future World sitting in the back of the park, working your way narratively from present to future. The design changed multiple times over the years to eventually reverse it to what we know now with Future World being the main entrance. The model below shows a middle-point, with Future World in front, but the American pavilion serving as the grand entryway to World Showcase. It is though interesting to look at the design of the park that was created and look at where it stands today in comparison. The original park seemed so unique and original when you first walked up to it’s gates. With the grand geodesic sphere of Spaceship Earth towering over the monorail station, you could see some of the design choices that would echo throughout the entire park. You saw that this park was not going to be themed entertainment like existed previously in Magic Kingdom or Disneyland. No castles, no jungles, not even the rocket ships of Tomorrowland. The World Showcase might be traditionally themed, but Future World was different. From the opening gates, you could see the recurring theme of the long, curved lines, the lighter color palate using silvers and light colored concrete. A view of the entrance to Epcot Center, curved lines, silver and white all over. The architecture seems to have one foot in the brutalism architecture movement, lots of large cement structures, one foot in modernist architecture, with it’s sweeping curves and vaguely futuristic viewpoint. (Architects take note: I’m not an architect and likely just made a massive hash of different architectural movements, I’m just going off of my vague understanding and quick confirmation on Wiki). There were not many straight lines in early Epcot, everything had interesting angles, curves, waves, and everything had an interesting design that looked different than what most of America would be used to seeing at that point in time. Even the walking paths were not straight lines, dealing with arcs and waves. The entrance left the ticket booths and brought you in curving paths towards Spaceship Earth. The gateway to Future World. The entrance was not cluttered, plants, grass, trees, water, and the crystal statue all brought us towards the future. An entryway clear of any sort of Legacy. One thing that comes to mind when I think about the design of the buildings within Epcot Center is the scene in Horizons when we first meet our hosts, sitting in their futuristic living room. If you look out the window at the city scene behind them, you’ll see very similar design styles. While their view is upon a “city” and Epcot Center was a set of pavilions, the same angles and curves are present. Horizons was looking into the future, and Epcot Center’s design was as well. Look at The Land building compared to the scene above. Very similar architecture. Adding this one just because it's gorgeous. I feel that the design work on Epcot Center was meant to reflect the future that the designers saw coming. With large cement structures, environmental impacts of construction were being lowered, and the light-reflecting colors were looking for methods to reduce the environmental impact required to cool the large buildings. Lots of light reflecting materials, photovoltaic cells on top of Universe of Energy, greenspaces in between buildings, all of these a vision into the designer’s view of the future. Over the years, there have been little tweaks to the overall design, but no truly massive changes. The biggest (worst) was the introduction of the odd diamond shaped canopy thing in the middle of Innoventions. Not large enough to truly provide shade, not small enough to block views, it just seemingly doesn’t fit in the location that it is in. Serving no purpose but to block a beautiful view. There have been other modifications of course, pathway changes, planters being added/removed, but mostly the general feel of the park remains today when being looked at from the outside. That is aside from the massive crowds of people who are streaming past Future World and only into World Showcase of course. As I make my way forwards in this Manifesto, I’m going to be working with one design goal in mind. I want to have an overall aesthetic change to Future World, but I don’t plan on making any massive structural changes to existing buildings. Instead, I think that there are many ways that they can be worked with and updated to reflect a new vision of the future, while keeping most major structures intact. Suggesting we reshape the buildings for no real reason at all would be just a giant waste of my non-existent budget. I do however think that we could make some fairly substantial changes to the visual impact and meaning of the entire Future World section of the park. To bring it forward once again. If Epcot Center was a vision of the future in the late 1970s, we can update the park to a futuristic view of the park from the late 2010s. Next time, I set out the visual direction of the park update. TL;DR – It’s about half of a great attraction as it stands right now, and some simple fixes could make it great again. I had a request this weekend to talk about the Universe of Energy / Ellen’s Energy Adventure. I’ve shared some opinions on this pavilion before, but I think I’m going to ignore those, not even look at what I’ve written before, and try and come up with some thoughts off the cuff. That way it’s hopefully a take that is fairly reflective of my current thoughts. While my take will be fresh, my overall opinion on the pavilion itself hasn’t really changed. The Energy Pavilion is one that I just don’t feel has ever really hit the mark. Not in original Universe of Energy version, and not in the Ellen’s Energy Adventure version. Both have their strengths and weaknesses, and both I think just never measured up to the bar of the other pavilions in Future World, and with the topic itself. The Disney Parks Blog this week has really been trolling me, and other lovers of Epcot Center. There was the 13 reasons we still love Horizons, the Advice on the future from 80s Epcot, and the Horizons quiz. They then fired a personal attack highlighting Kitchen Kabaret, which had to be targeted directly at me. It HAD to be. I’m the dude that spent hours last year drawing characters from Kitchen Kabaret to make my own personal T-shirt to wear specifically at WDW. Veggie Veggie Fruit Fruit 4 Life! Anyway, sidetrack. The Disney Parks Blog seems to be poking the stick at us grumpy original Epcot fans, there have been questions bouncing around akin to: “Is Disney bringing back Horizons?” (spoiler, no). I think that it makes it as good a time as any to talk a little about what is mostly seen as Epcot Center’s prized jewel, Horizons. The Living Seas. In some of the DisNerd community, this is a major rallying point for people against the "toonification" of Epcot. This term is being used as a derogatory term against bringing characters into Epcot. It seems like this would be something that I would be right there rallying against, yet in theory, I am not. How this is done in Epcot today is a different beast all together. I was originally going to talk about Toonification in this post, but I think I’ll save it for a full post for a deeper exploration. Let’s stick to The Living Seas of yesterday and today. You would walk in, past the existing rock-work water feature with the crashing waves. No seagulls screeching “Mine – Mine” obviously, just the occasional crashing waves, the sound and sight setting up a quiet trip to a rocky seaside. The story starts here. The queue wound through the queue fairly similarly to what exists now, but as you walked, you were taken past historical pictures and examples of human kind's exploration under the water. Graphics showing the design of early snorkles, diving bells, actual early dive suits. This pavilion was not about the ocean, it was about oceanic exploration. Our quest to understand the mysteries of the seas. I’ll likely include a supplemental post again with more detailed information, but think about this. The Homo Sapien has been on this Earth for estimates that go well over a million years. Until the late 1800s, it was thought that ocean life could not physically exist under 1800 feet due to the pressure. It wasn’t until the 1930s that the first successful trips down below 500 feet. Less than 100 years in an existence that stretches back millennia. The invention of the Bathyspehere in the early 1900s is the first time we were able to explore oceans at any real depth. The queue brought you to section that served as a waiting area for a preshow film. You were then taken into a small theater to watch a short film, which I'll once again admit a deep and undying love for and bias towards. The film, entitled “The Sea”, in 8 minutes covered the creation of Earth, the creation of the oceans, the importance of the oceans to life, and the fact that we know next to nothing about them and that we are still discovering new things in them. Pausing for a brief moment, as a child (I would have been 10 in 1986), this is the first time that any of this had ever even come into consideration for me. I had never thought about how the Earth was created. I had never thought about how the oceans came from rain. RAIN! There are so many lines that stuck in my head during this film, but the one that always had it's intended effect on me is "...waiting in a world where we've spent less time than on the surface of the moon." It was meant to convey the idea that there is so much there yet to be discovered, and it worked like gangbusters on me. I have an audio version of this film, and I honestly listen to it in my car when driving, and it still excites me every single time. Once you left the film, you were ushered into another room to await boarding your hydrolator. Now, that is an odd word. Hydrolator. I'm guessing they made it up for Epcot, but I have never researched it. Anyway, you boarded what amounted to a fake elevator. This was going to "take you down to Seabase Alpha". The floor shook, bubbles went up, an effect was made to look like the we were scrolling past rocks on our way down deep under the sea, and a minute later, the other door opened up and you were under the ocean. The effect was simple. You know what, as a kid, it worked like gangbusters to me (to show how well it works, just look at Universal in their brand new Gringott’s ride, that elevator is just a spruced up Hydrolator). I don't remember how many years I truly believed that those things really did move, even if it was just taking me down one floor or something. My disbelief was suspended enough to really buy into the fact that we were on a seabase under the ocean, even if I knew it not to be true. You boarded a clam shell vehicle which took you on a quick ride into the Seabase itself, and it was kind of useless as a ride honestly. Once you arrived in the area that now makes up the post-ride pavilion, it was themed to be an actual seabase. Do you see how the story is continuing. We arrive at the seaside. We are talked to about oceanic exploration. We get a sense of the importance and mystery of the ocean. We then go to a “seabase” that is being used for undersea exploration and scientific study. The huge aquarium was not just an aquarium, but it was part of the show. These were windows from the seabase out into the ocean. This is a point I cannot make strongly enough. The entire idea of the aquarium was that it was the ocean, the scientists (and us by our luck in being able to visit a working scientific research station) used these windows out into the ocean for their research. Again, this is not something that had to be beat over our heads. It was not overly explained. It just was. The little side alcoves had different things to see and do. I remember a little cartoon film in one that I used to love, with Atlas explaining plate tectonics. Again, it was the first I learned of Pangea, the super-continent. A lot of the rest of the pavilion is very similar to what exists now. Things to see, learn, do. Touchscreen computers, a section about undersea exploration robots and suits where kids could get in a suit and try and manipulate the pincer hands. The main room had the big water tube, and divers would constantly be coming and going from there into the main aquarium space. The research station with the manatees all lived within the seabase theme. All together, it added up to one pavilion, one purpose. You were arriving at a seabase, which was being used to explore the world under the ocean. It taught and entertained. So, we look at the pavilion as it stands now. We have the Nemo ride itself. The queue in my opinion is well done and fun as it relates to the current attraction. I enjoy the idea of walking down the beach and under the water. For what it is, I'm ok. I obviously prefer the previous version, but I accept that the queue is well done for it's designed intent. The ride itself feels like an odd bird. It is telling some weird version of the original film story, with Nemo missing again, taking us through a "greatest hits" of characters. The video technology is cool, but the ride just feels slapped together, ending in that Blue World song that they used from the Nemo musical. It's an odd mix between a Fantasyland "book report" style dark ride, but it’s a different story, but a story that is a rehash of the film, but not the film... It just looks like they said "Well, what if Nemo got lost again and we asked all his friends to find him, but the little guy is just playing hide and seek so there is no actual drama in the ride, since the only people who think Nemo are lost are his family." The pavilion itself is ok, standard aquarium fare. The Shedd Aquarium here in Chicago is better. I enjoy Turtle Talk with the kids. I have no problems there aside from the fact that it really doesn't tie into the story of the pavilion more than it's related to Nemo, and it could have easily (If this were still a seabase, having a window which we can speak to Crush is part of the story!!). The biggest problem is that the huge aquarium here feels like an afterthought, not the focus. Here you have a 5.7 million gallon aquarium that does not feel like the star attraction. I'll bet there are plenty of people that don't even walk out to the observation area, they ride the ride, look at a couple tanks, and walk out the door. There is a massive aquarium that was perfectly themed to look like the ocean floor, with the sparse nature of the underwater habitat meant to look like an ocean disappearing out into the distance. Since we’ve lost the seabase story, we’re now looking at an aquarium that looks like a second-rate city aquarium. Where does that leave us? I can pinpoint what I think that the faults are in the existing attraction. The ride has such a poor story, it looks cheaply made, and it has no tie-in to the rest of the pavilion. 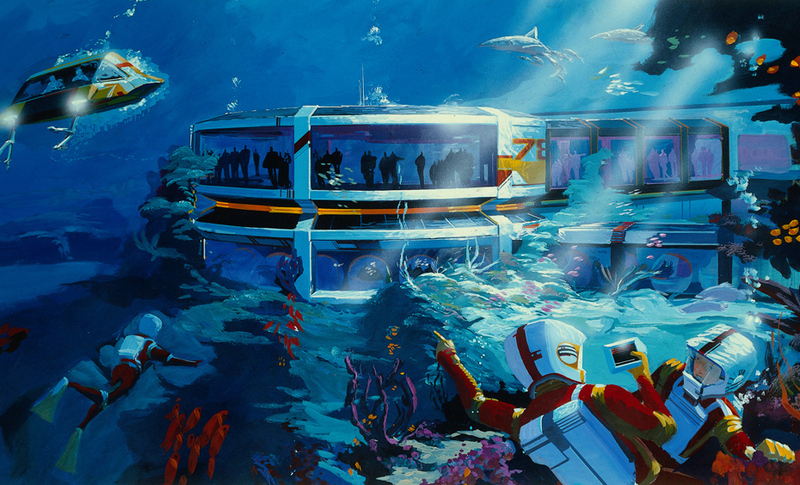 I wish that undersea exploration were still the focus of the pavilion. I wish that it tried to inspire people to want to think about how we explore and use our oceans in the future. I wish that this pavilion is where they had chosen to partner with James Cameron, as his love for undersea exploration is well known. Cameron could have knocked it out of the park in his sleep. Even I have some ideas for what could be done which I’ll explore later, the main one (GASP) includes keeping Nemo associated! Mainly, I think what is missing is that sense of purpose. The previous version was meant to teach you about the ocean, while making you think "Why don't we know more about something that makes up 70% of our planet? Will we know more in my lifetime? How cool is would it be to go in a submersible?" The new one feels, to me, more like "come ride our ride, maybe look at some fish, and buy some Nemo merchandise on your way out". That to me is a massive waste of a beautiful and important pavilion. After writing Monday's post on The Land and touching on the use of water in agriculture, I coincidentally stumbled into some information that I thought tied in very closely to my post. First, I linked to this on Twitter, but would be remiss if I didn't mention the phenomenal work done at The Epcot Legacy on their Future World Soundtrack Series (specifically The Land for this post). Download and donate, you'll be happy you did. Now, on to the supplemental material. I'm a massive podcast listener, I listen through my commute every day, while I work out, and pretty much any time I feel I can concentrate on the material being presented. The TED Radio Hour is one I've subscribed to, but haven't listened to much, mainly because I had other podcasts I was catching up on. Yesterday morning, while on the train, I randomly picked one episode of the TED Radio Hour ("Finite") and part of it dealt with water use in agriculture. It fits in very well as a companion piece, and honestly should be a point of focus on Living with the Land, as we tour the greenhouse, so that more people understand the issue. If anyone is interested, here is the full TED talk from Jon Foley, director of the Institute on the Environment (IonE) at the University of Minnesota. Also, while I'm here, there is a good episode of NPR's Planet Money on the subject as well. This one about the water usage in California agriculture, especially timely because of the drought. It covers farmer's usage of water to grow water-needy crops like Almonds and the pros/cons of draining their existing aquifers to grow these crops that are in high demand. To continue along the podcast trail, there is a 2 part StarTalk Radio (live) with Neil DeGrasse Tyson, where he speaks about water and the current/upcoming problems with a cast including Robert F Kennedy Jr. who works with the Waterkeeper Alliance. If you are into this kind of thing, and know of more interesting stories, articles, podcasts, videos, etc, please feel free to drop them to me in the comments or via email/facebook/twitter. I'd love to continue to explore this. This is a quick snippet from the introduction of Walt Disney's Epcot: Creating the New World of Tomorrow. From "Walt Disney's Epcot: Creating the New World of Tomorrow"